LexBots are Super Heroes minifigures that appear in LEGO Batman 2: DC Super Heroes. In the console versions, the LexBots have a green, robotic torso with lighter green appendages. They have grey feet, carry large grey guns, and have round grey heads. 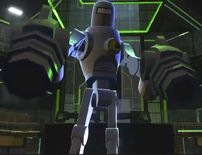 The Silver LexBot looks identical to the standard LexBots, except it is completely metallic silver in colour and holds two guns instead of one. 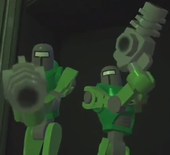 The DrillBots are the same as the normal LexBots but they have a drill head. The Advanced LexBots hover and look stronger than normal LexBots. In the portable versions of the game the LexBots take the same detailing except that they have standard minifigure torsos and legs, being more like robotic minifigures instead of robots. They are common enemies throughout the game. In LEGO Batman 2, the LexBots are created by and minions of Lex Luthor as enemies for Batman and his allies. At the beginning of the story, a silver Lexbot (disguised as a female receptionist) is seen aside Lex Luthor at the Man of the year award ceremony. Later in the story when "she" is encountered by Superman and Batman at the reception desk, "she" wipes off the minifigure disguise and starts attacking them. The LexBots can be unlocked the same way as the henchmen on consoles; groups of them will appear at different areas around the city and once one is remaining, it will surrender and can be purchased. On the portable versions the LexBot is unlocked for purchase after finding its minikit in Juggernaut Chase. They cost 5,000 studs. This page was last edited on 9 January 2016, at 21:51.